Yammer is more and it is less than Twitter. Yammer is ‘Twitter for inside your company’. I private micro-blogging status update service that only works with your colleagues at work. Your identity is based around your official company email. While Yammer is a web-based service, rather than something you install on your company network, it is only accessible to you and your signed-up colleagues – updates and information do not appear on the world wild web and will not show up on Google. It’s private and secure. So Yammer feels like the solution for teams, groups and departments inside the company, behind the firewall. Yammer may well be an easy way to get social media into a corporation without risk of public exposure and with a reduced risk of upsetting anyone (caused by poor choice of words). So how could I justify Yammer to my boss? I feel that Yammer and ‘yammering’ could help a great many people in our company, perhaps 20% or so, to keep in touch, get engaged and know more about what’s going on. I also feel that Yammer could be a valuable communications channel for the Internal Communications team, so I must discuss it with my manager. But there’s a cost of course. Yammer can be used for free, but there are no administrative tools unless your company (not the individuals) chooses to pay for all accounts. Yammer charges on a per person per month basis. At £1.83 ($3) per person per month the cost is neither small nor in any way large for a big company. What if it became popular? What if, even with tight admin, the costs spiralled each year? What about ‘dead accounts’? Beyond the modest financial ramifications is the culture shift concern. While I would of course suggest rolling Yammer out through obvious small teams first, teams and departments we know and can talk to, getting ‘everyone’ involved with Yammer could bring the house down on us. People will ask why we’re wasting time and money on something so facile. Time spent yammering could be judged to be time spent skiving. The obvious comparison is Instant Messaging around the office. IM provides ample opportunity to ask quick questions, get things done quickly and co-ordinate a group of people when time and timing is of the essence. But IM can become overly conversational to the point that it’s distracting, too personal and a waste of working time. I don’t think Yammer should replace Instant Messaging; conversations and fact checking / instruction giving should still be done by email / phone / IM I think, but you can see how the time wastage concern is for both Yammer and IM. Time is money, and some people are really really busy and don’t like to see people ‘idly’ social media-ing. So how shall I demonstrate the benefits of Yammer, and how shall I justify the financial and time cost? This article was tagged engagement, internal communications, Intranet, Social, Twitter, yammer. May I ask what the administrative tools are, and how important they would be? Would it be possible to start by using Yammer for free, just within the Internal Communications team, so you could assess how valuable it is before making a financial commitment and adding tools? As for time, I would imagine that people would be more careful about using Yammer as ‘Yams’ (is that a Yammer version of a Tweet?!) would be seen by all ‘members’, whereas I assume the IM conversations are private and therefore more open to abuse. The def way forward is to test Yammer for free with my team, then another team so that we have fewer than 30 users. 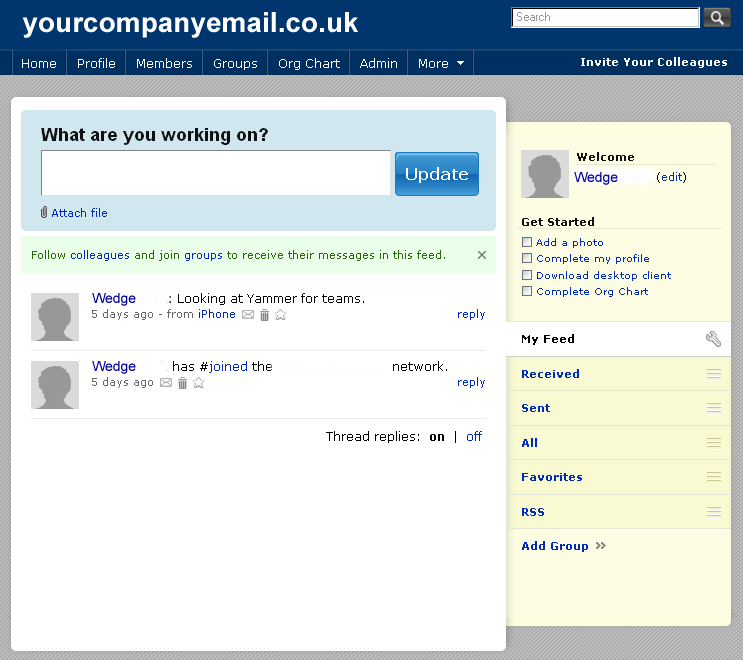 But eventually the rumour mill / grapevine would mean that more people would randomly hear about our Yammer and join. At this point, it would be responsible to have a Yammer Standard / Policy in place so that no one abuses the system, and then we’d want to pay for the Admin tools so we could manage yammers and accounts. Yes, people *should* take care of their tweets, but my company is staffed by people with only a small amount of experience in self-expression and social media, so mistakes will happen. Mistakes could ‘blow up’ and cause people to react – “Close Yammer” et cetera et cetera, and I don’t want the flak or a failure against my name! Then I would suggest you start the free trial, and endeavour to keep it to invited people only until you’ve had long enough to assess its effectiveness. Once people start randomly joining, then the decision must be made whether to keep it or not. If you do, then as you say, you will need strict guidelines to manage users / usage, but as nobody will be anonymous I would hope they’d take greater care with how they tweet. Problems are inevitable, but if managed carefully I don’t see why Yammer can’t be a great asset to your company. Great post and something that i think rings true for many internal communicators. To help build the case why not define a purpose – trial it with a project group that are separated throughout the company – get them to use it to keep information flowing about the project and see what the feedback is from them. If it works – you have the start of a case to get Yammer expanded across the whole company. MY advise – find the purpose, ensure you have the content to make it useful and you have the right culture for it to work. Would be great to hear how you get on with this and what the bosses say! I very much appreciate all your thoughts. While I blog about a great many internal comms subjects, trying to decide if I wish to bring Yammer or an alternative system into the company I work for (when budgets are so tight and Social Media is not valued) is a big decision. This blog post is very much a ‘real life’ matter for me, thank you. Yammer is just one out of many offering virtually the same. Personally I am looking more towards SocialCast. They provide the administrative tools (as well as a number of other things) for free. An internal micro-blog is a little like email was in 1995 – unknown and not quite trusted. I think the key thing is to set out some standards (take a look at the internal social media guidelines of Intel and IBM – freely available on the web) and then work with key influencers in your firm to break down the ‘I’-based resistance. eg ‘I already use email to collaborate with my colleagues’ ‘Yammer’s designed to augment, not replace’ ‘I don’t know what it’s busienss use is?’ ‘Let’s test it and find out…’ Good luck Wedge – I think micro-blogging is a game-changer. Hi Wedge, thanks for inviting me to comment on your blog post. I agree with Grover and setting out standards when first introducing social media to the company. As a Twitter user, I feel it could be an incredible knowledge sharing tool for an organization, particularly when used to enhance the intranet and information sharing/collaboration among employees. Information is knowledge, knowledge is power and companies (should) be looking to harness and store the knowledge of their greatest assests – employees. My recommendation would be to put together a “case study” of how a micro-blogging tool could benefit the company, give some examples on how it could be used, and why you think it could change internal communications. You’ll need these examples not only for management in getting buy-in for Yammer, but also for employees when it is rolled out. Those not familiar with Twitter will wonder what it is and how they are supposed to use it. Like any tool, user adoption is key for it’s success. Good luck! We ran a Yammer pilot where I worked. It didn’t take off, for a few reasons. 1) No one was prepared to pay per-user costs to administrate. While the number of users on the pilot was small it wouldn’t have been an issue, but with 2,000 wired employees this could theoretically grow to be a significant monthly cost. 3) Organisational culture; we have a real silo culture here which can’t be changed overnight. People simply aren’t in the habit of sharing and connecting with colleagues. I had hoped Yammer would be a bit of a training ground for the launch of our new intranet (our current one has no social functionality). Moreover, there isn’t an enormous appetite here for technology in general; people like to do things here as they’ve always done. 4) Email alerts were automatically set to on. This meant every user got an email every time another user joined, left a message, wanted to connect. Even with a very small number of users the volume of email was annoying. Users could change email setting themselves, but many weren’t aware of this so it caused many complaints. I understand Yammer have now changed the default setting to emails off, but this is ultimately the issue that put most users off. As a long-time geek and regular Twitter user I think Yammer is a great tool and has enormous potential to aid communication and collaboration – but in organisations other than mine. Thank you thank you; I’m looking and looking, and I really appreciate your real-life ideas. So many priorities for the business – can I shoe horn social media / mini-collaboration in? I’ll have to create some walk-throughs and see what my boss might think later this quarter. The problem I see with Yammer is the connections (person to person) are to simple for the enterprise. If I follow everyone I work with then my feed would be like drinking from a fire hose. There would be more noise then signal. In the enterprise you are connected to people based on what is going on, work and deliverables. In the enterprise my connections are very dynamic. Someone I am connected to this week I may not be connected with next week.